Comment: one of the main characters of the blogosphere is to dig out music having been produced many decades ago and having the status of virtually forgotten. Given that many of these blogs used to have a considerable following it will give a refreshing impulse to many projects. One of the most striking categories is music which can be pigeonholed as minimal synth, krautrock tinged experiments most of them following DIY attitude. 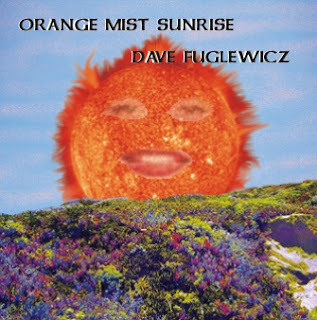 One of those issues is also Dave Fuglewicz's Orange Mist Sunrise/Orange Mist Sunset consisting of 12 tracks. You can see an impressive analogue synthesiser-based technical park on pictures and your sonic experience probably fits with it. One hears throbbing Moog synths providing the pace and intriguing layered synthesises with different phases on experimentation. You can hear how different layers used to shift against one another, more profoundly, one of the layers is switched off white the other one is switched on for pitch effects, deceleration and acceleration, lots of arpeggio moves. And vice versa. All of that used to happen in a minimal vein and at the same time you obviously figure out it is an example of improvisational music. And at the same time it does not do away with a free flow and psychedelic facets. It might be you start thinking of it as way too lengthy but one should consider the fact it is in concordance with the nature and mind of this kind of music. Remember the works of Tangerine Dream, Klaus Schulze, for example. By the way, with regard to contemporary synth wizards like M Geddes Gengras, Steve Hauschildt, Daniel Lopatin you can see the same tendencies to go on. The issue was the tape of a month of The Living Archive of Underground Music curated by Don Campau.